Wharton's Gregory Shea and Christiana Care's Mark Schneider explain how AI can boost access to health care at a much lower cost. Solomon and Shea are co-authors of Leading Successful Change, published by Wharton Digital Press. Solomon teaches change management at Wharton’s Aresty Institute and consults on strategic organizational change through her firm, The New Group Consulting. Shea is adjunct professor of management at the Wharton School, senior fellow at Wharton’s Center for Leadership and Change Management, and adjunct senior fellow at the Leonard Davis Institute of Health Economics. Schneider is the chief of anesthesiology and the associate physician lead of the Surgical Service Line at Christiana Care Health System. He also is the clinical lead of the health system’s futurist group. Technology infused with artificial intelligence awaits introduction throughout America’s health care system. What that introduction will mean and what impact it will have depends on non-technological decisions, on human factors. It will depend on the intent of the leaders who guide its introduction. Artificial intelligence applied at the point of care in the form of smart devices or intelligent agents can offer the promise of augmenting and extending the work of every clinician. They promise to free clinicians from the burden of low-value, rote activity and improve clinician burnout, while improving access and quality outcomes for populations. In order to realize the full value of this new technology, we believe that health systems need to adopt a systems-based approach to its implementation. Layering on new technology without transforming the underlying workflows, teams, roles and decision-making used to work with it will not shift the cost and value curves nearly enough in spite of mounting external pressure to reduce health expenditures. At the level of the clinical practice, intelligent devices can augment the clinician’s ability to make decisions based on complex data and play an increasing role in prediction tasks like screening and diagnosis. At the population health level, if applied as a lever to move the whole system, AI-powered devices and intelligent agents have the potential to fundamentally change the economics of health care. Screening for diabetic retinopathy provides a useful case in point. Historically, health systems have viewed technology as an expense rather than an investment. The expense could be justified when using the technology resulted in reimbursement, and under the fee-for-service model, the more it could be used (and charged) the better. As the health care system shifts to pay-for-value, and reimbursement is based more on episodes of care, bundled payments and the health of populations, these purchases will need to be justified differently. To see the purchase as an investment with a valuable ROI, the tech will need to be tied to meaningful reductions in cost and measurable improvements in clinical outcomes. Both have been historically difficult to demonstrate. We believe that a systems approach to purchasing and implementing AI based technology can transform the delivery of care in a way that dramatically reduces cost, while it improves access and value, thereby benefiting industry players and their customers alike. A use case that can illustrate what we are talking about is screening for diabetic retinopathy. Ocular disease is increasing as the population ages and the prevalence of diabetes rises, and it is projected to go up threefold by 2050, according to Johns Hopkins Hospital’s Wilmer Eye Institute. Diabetic retinopathy is the leading cause of blindness among working-age U.S. adults, even though 90% of it can be prevented through timely screening and treatment, according to Current Diabetes Reports, a monthly medical journal. At present, screening is accomplished through examination of the retina by a trained ophthalmologist or other specialist who then interprets the image and recommends treatment. The FDA estimates that 50% of the millions of diabetics in the U.S. do not see their eye doctor annually. In addition, access to care is a global problem. In countries such as the U.S. and the U.K., specialists are available for treatment, but access is limited by geography and by byzantine payment systems. In other developing countries, access to specialists is limited by lack of personnel, deficient transportation systems and inadequate equipment. Barriers to widespread screening include lack of access to care, and multiple workflow and systemic level impediments. Remedies being attempted include tele-ophthalmology, which improves the ability to get the image to a trained reviewer, the ophthalmologist, and expanding the role of primary care physicians to perform scans. We have quietly passed a watershed moment. In April this year, the FDA approved an AI-based system to detect diabetic retinopathy, the first autonomous AI system to be authorized for commercialization. The device, IDx-DR, is a software program that uses an AI algorithm to analyze images of the eye taken with a retinal camera. According to the FDA, it is the “first device authorized for marketing that provides a screening decision without the need for a clinician to also interpret the image or results, which makes it usable by healthcare providers who may not normally be involved in eye care,” according to Health Data Management (April 13, 2018). This machine can relieve specialists of the burden of reviewing normal scans and free their schedules to provide treatment for patients who are identified as at-risk for diabetic retinopathy. Why are we interested in this particular case of retinal screening? This example illuminates the change management choices that we believe the American health system will face again and again as this kind of AI-enabled technology multiplies. We are interested in the way this technology might be implemented both at the clinic level and at the level of the population. Before thinking about a broad introduction of this technology, let’s stop for a moment and consider the alternative: a too-limited application. The technology was first trained in 2015 using 76,370 images and then tested in 2017 against an expert panel of professional graders (retinal specialists, general ophthalmologists, trained graders and optometrists) as the reference standard. The technology performed with between 90% and 95% sensitivity for identifying diabetic retinopathy. As with other machine-learning innovations involving imaging and diagnosis, the machines are beginning to perform as reliably, or more reliably, than the humans. If this medical device is simply deployed in the specialists’ office, it might greatly improve productivity, accuracy and also relieve physician burnout from repetitive, low-value scanning work. Improving productivity would have a modest effect on access, opening new patient slots, but this limited implementation of the technology would not dramatically improve access to the scans or the overall health of the diabetic population. This limited deployment represents a “new technology as a cost” example mentioned earlier, where a superior tool is applied to the original system of care with limited effect. In order to escape from this room, many people in the health system will need to think differently and to design their system accordingly. 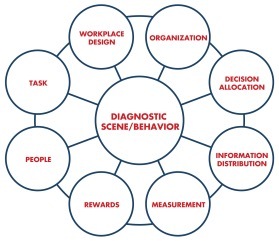 At the center of the model is the “scene” or new “behavior” that a change leader envisions. This is the desired future state. In this example of diabetic retinopathy, the system wants to deploy this technology in a way that dramatically reduces the cost of care and significantly improves the outcomes for the diabetic population. For the primary care clinic, how would the introduction of automated screening change the care of the patient panel? 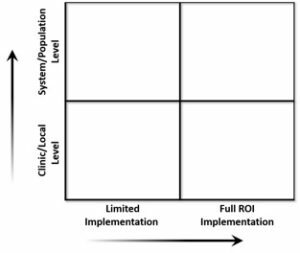 What changes in patient engagement, workflow, follow up and the clinic’s relationship with the specialists would be required to implement a system that can greatly reduce cost and blindness? For the specialists, how will scanning in the community affect the volume and type of patients they see? How will they get the information they need from the scans in order to provide further treatment when indicated? For the leadership of the health system, the problem can be re-imagined as how to best provide improved access to care and then treat the uncovered burden of patients. The current system is built to serve X number of patients using the trained specialists to both screen and then care for the patients. AI-based screening in the community simultaneously relieves the specialists of first-pass image interpretation, but potentially significantly increases their work as referrals for treatment increase. We apply the eight levers of the Work System Model to stimulate this discussion. Workplace Design: Any discussion of technology implementation begins with the tools in use as well as the physical location and design of the environment. In this case, the existence of a new screening tool can also shift the location of care, which we believe will be a common theme. Optical scans that today are performed by a specialist can now be performed in a primary care office. We can look ahead and wonder if further shifts are possible — will the scans be performed at workplaces or at the mall? People: This lever not only refers to the person who does the work, but also their skill level and how they are trained. In this case, the shift is from the specialist physician to a primary care physician performing the work. They will need to accept the new work as part of their role and be trained on the tool. We can look ahead and wonder if this shift is significant enough. Since the AI is autonomous and capable of ruling out diabetic retinopathy, might it be used safely by an RN in the practice or by a community health worker in the community? Different levels of acceptance, training and certification are required for each shift we imagine, and “practicing at the top of the license” may eventually need to be redefined. How will the specialists feel about releasing this scanning work to others in the community? How will they feel about the more complex work that will likely take its place? Decision-making: Socio-technical design research has posited for decades that as information flows to people lower in any system, the potential for decision-making authority flows along with it. Equipped with this scanning technology, can decisions that have traditionally been reserved for physicians shift to their nursing colleagues? To community health workers in the field? These are profound changes in role as well as in practice that need to be considered, tested, validated and implemented if the true potential of AI technology is to be realized. Task: This lever refers to the workflow, which will be most dramatically changed at the point of care, whether that is the primary care office or the mall. Digital technology invites a complete reconsideration of workflow and practice, so as not to automate old analog processes and miss the opportunity to transform. Metrics and Information Distribution: As we move towards a future that is hyper-connected and filled with sensors emitting data, we need to think about what information is collected (metrics) and how it flows through the system. In this example, how will the results of the scan be given to the patient and by whom? How will those results unite with the patient’s medical record and with the specialist if they need further treatment? Understanding, designing and mapping the data supply chain will be a critical competency for health systems in the future. Organization: This lever refers to the structures we create to support the work, whether formal (team membership, reporting relationships) or informal (meetings, networks, informal communication channels). At the level of the practice, there will be implications for how to connect people to create a success change. For example, is there a daily huddle? Is there a monthly meeting to review the new process? Is there a hotline to the specialist’s office? Is there a structured one-on-one conversation with people who are using the new technology? At the leadership level, this is one of the most profound levers to consider. What kind of organizational structure supports these new ways of working, and how can we move toward it at anything like the speed of technological change? Reward: This is where some of the most profound shifts are occurring in the health care industry as it moves from a pay-for-service to a pay-for-value model. Traditionally, a new device like the retinal scan in a specialist’s office would be a revenue generator, as a fee is charged for every test or procedure. In a pay-for-value world, the goal is to bring the cost of screening down as low as possible, so giving the device to an RN or a community health worker to use would be advantageous. Multiply the advantage by reducing the cost of treating unnecessary blindness, and the ROI for the device improves even more. Once the leadership thinks about the population health implications of this type of AI technology, then leaders at the level of the clinic can think through the eight levers to implement change at their local level. The first decision – to implement this technology in a systemic way that takes full advantage of its potential – will need to be made at the health system and population health level first. It can be a heavy lift. Artificial intelligence technologies can fundamentally change the way care can be delivered if they are deployed with imagination, scope and courage. They can have a profound impact on our patients, the quality of their outcomes, and our costs. But we need to acknowledge and anticipate the profound impact these changes will have on the caregivers themselves, because they will ultimately be the ones who carry the system through disruptive change — or not. Artificial intelligence (AI) aims to mimic human cognitive functions. It is bringing a paradigm shift to healthcare, powered by increasing availability of healthcare data and rapid progress of analytics techniques. Artificial intelligence (AI) in healthcare is the use of algorithms and software to approximate human cognition in the analysis of complex medical data. Specifically, AI is the ability for computer algorithms to approximate conclusions without direct human input. What distinguishes AI technology from traditional technologies in health care, is the ability to gain information, process it and give a well-defined output to the end-user. AI does this through machine learning algorithms, which can recognize patterns in behavior and create its own logic. In order to reduce the margin of error, AI algorithms need to be tested repeatedly. AI algorithms behave differently from humans in two ways: (1) algorithms are literal: if you set a goal, the algorithm can’t adjust itself and only understand what is has been told explicitly, (2) and algorithms are black boxes; algorithms can predict extremely precise, but not the cause or the why. The primary aim of health-related AI applications is to analyze relationships between prevention or treatment techniques and patient outcomes. AI programs have been developed and applied to practices such as diagnosis processes, treatment protocol development, drug development, personalized medicine,and patient monitoring and care. Medical institutions such as The Mayo Clinic, Memorial Sloan Kettering Cancer Center, Massachusetts General Hospital, and National Health Service, have developed AI algorithms for their departments. Large technology companies such as IBM and Google, and startups such as Welltok and Ayasdi, have also developed AI algorithms for healthcare. Various specialties in medicine have shown an increase in research regarding AI. However the specialty that has gained the greatest attention is the field of Radiology. Such an ability to interpret imaging results may allow clinicians to be aided to detect a change in an image that is minute in detail, or something that a clinician may have accidentally missed. Such a study that has incorporated AI in radiology is a study at Stanford which has results presenting that the algorithm that they created can detect Pneumonia better than radiologists. The radiology conference Radiological Society of North America has implemented a large part of its schedule to the use of AI in imaging. The 104th Scientific Assembly and Annual Meeting organized by RSNA in November 2018 showcased novel AI imaging tools. Among these was Samsung’s S-Detect for Breast, which is a radiology ultrasound tool that standardizes the way in which breast pathologies are classified and reported. The event also highlighted AI studies in radiology, such as the use of AI in identifying metabolic brain changes for the early diagnosis of Alzheimer’s. The emergence of AI technology in the radiology discipline is perceived as a threat by some specialists, as the technology can perform certain tasks better than human specialists, changing the role radiologists have currently. The increase of Telemedicine, has shown the rise of possible AI application. The ability to monitor patients using AI, may allow for the communication of information to physicians if possible disease activity may have occurred. The use of a device such that a person may wear, may allow for constant monitoring of a patient and also for the ability to notice changes that may be less distinguishable by humans. The subsequent motive of large based health companies merging with other health companies, allow for greater health data accessibility. Greater health data may allow for more implementation of AI algorithms. A large part of industry focus of implementation of AI in the healthcare sector is in the clinical decision support systems. As the amount of data increases, AI decision support systems become more efficient. Numerous companies are exploring the possibilities of the incorporation of big data in the health care industry. The following are examples of large companies that have contributed to AI algorithms for use in healthcare. IBM’s Watson Oncology is in development at Memorial Sloan Kettering Cancer Center and Cleveland Clinic. IBM is also working with CVS Health on AI applications in chronic disease treatment and with Johnson & Johnson on analysis of scientific papers to find new connections for drug development. Microsoft’s Hanover project, in partnership with Oregon Health & Science University’s Knight Cancer Institute, analyzes medical research to predict the most effective cancer drug treatment options for patients. Other projects include medical image analysis of tumor progression and the development of programmable cells. Google’s DeepMind platform is being used by the UK National Health Service to detect certain health risks through data collected via a mobile app. A second project with the NHS involves analysis of medical images collected from NHS patients to develop computer vision algorithms to detect cancerous tissues. Intel’s venture capital arm Intel Capital recently invested in startup Lumiata which uses AI to identify at-risk patients and develop care options(Wikipedia).